Today: A dinner to make August feel more civilized. My dinner parties -- like me -- are never normal. So why, amidst the tiki parties and carbonara parties and taco nights and stovetop clambakes, the Monday-night margaritas and the indoor s'mores, am I telling you to make a cohesive, French-y, fussy-sounding menu? Why, after you've cried at work and sweated on the subway, after you ate corn for dinner for a straight week with a butter-slathered grin, would you ever come home on a Monday to a group of friends and make, of all things, ratatouille? You're making ratatouille, and you're serving salad and cheese-y toast alongside it, because in the heat and chaos and whirlwind that is August, feeling normal is abnormal. Feeling normal -- feeling like a person who does not eat the cookie dough chunks out of ice cream for dinner -- is necessary. Make all of this tonight, if you'd prefer, and invite friends over for tomorrow. Remember what vegetables taste like when they're cooked. Have a glass of wine. And feel, finally, perfectly, gloriously normal. 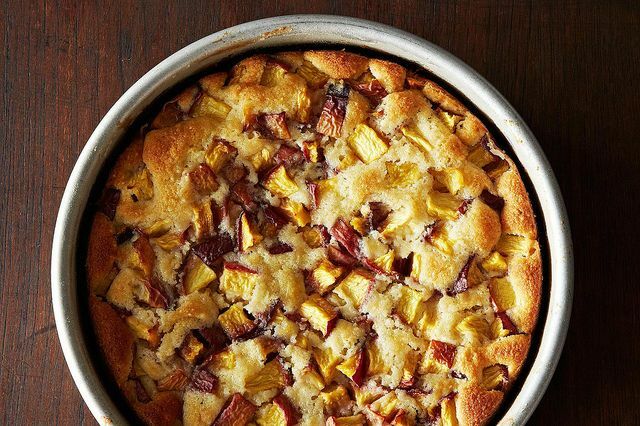 The night before: Make the peach cake. Prep all of your ingredients for the celery salad; slice the celery and radishes, pull your parsley, make your dressing. Store them separately in the fridge; you'll finish it tomorrow. When your guests are mingling and drinking and it's almost dinnertime: Head into the kitchen. Slice long piece of bread -- one for each cheese toast, and an extra for each guest with which to mop up their ratatouille. While the bread is toasting, slice hunks of cheese as thick as your toast. 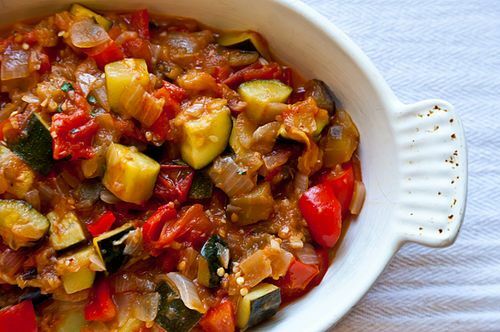 Warm up your ratatouille. 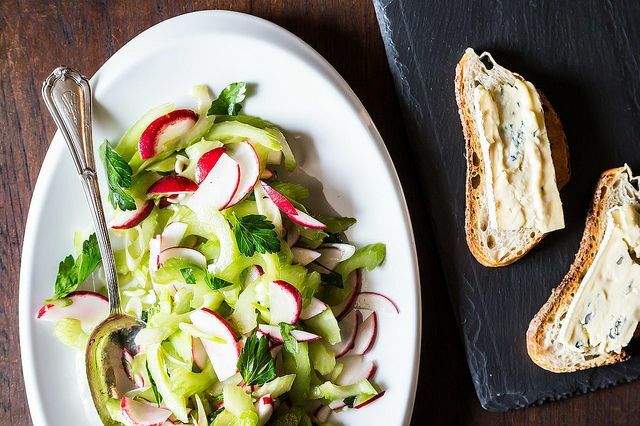 Toss together the celery salad. Top your warm toast with the cheese, and bring it all out to the table. When all the food is done: Bring out the peach cake, cut into fat wedges. Maybe whip out whatever ice cream you have in your freezer. Feel like a real person again.